Apple didn't let customers pre-order the iPhone 5s, and when the device launched on Sept. 20 it didn't offer in-store pickup either, meaning if you wanted a shiny new iPhone on launch day you had to stand in line. It was a smart move on Cupertino's part, which helped drive excitement for a smartphone that offered few major improvements over the previous model. 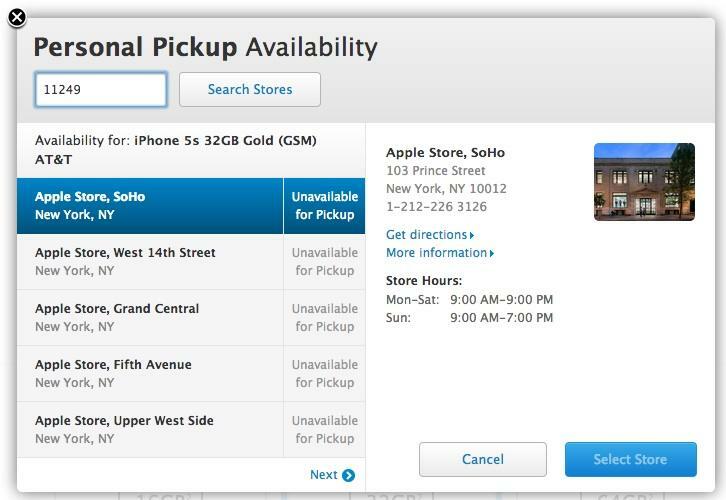 Now, with launch weekend and 9 million sales safely behind it, Apple is finally offering Personal Pickup for the iPhone 5s. The iPhone 5s was actually available for in-store pickup last week for a single day, but the option to pay for the handset online and pick it up the same day at your local Apple store was quickly pulled from the company's website. Now, the offer is back on the table, though supplies of the flagships smartphone still appear to be extremely limited. A few quick searches of New York City stores reveal the space gray 16GB model is only available at the company's flagship 5th Avenue store. Meanwhile, the elusive gold-colored iPhone 5s is completely sold out. Apple reportedly manufactured a small number of gold smartphones, and was forced to increase its production order following a strong consumer response to the device.